Here is a tutorial to install "Apache, PHP, MySQL" server simply. The solution used is called "WAMP" (Windows Apache MySQL PHP). 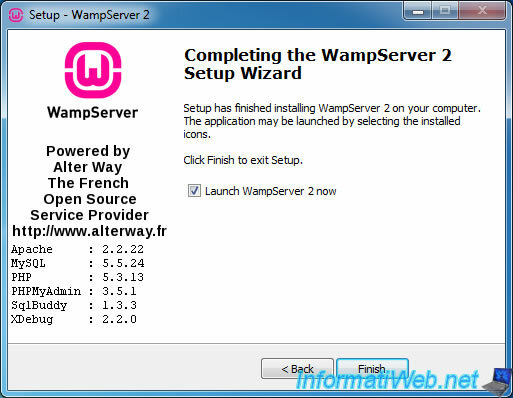 This tutorial allows you to install new versions of "2.2" and "2.4" WAMP. For those looking for the old tutorial on the "2.0" version, click here. CAUTION : If you have already tried to install a web server or PHP before, this tutorial may not work. In this case, it will attempt to delete the remaining files, services and registry keys created by them to avoid conflict with WAMP. If you want to install WAMP 2.2 or 2.4, you must install the C++ libraries 2010 needed by Apache to prevent the error "msvcr100.dll is missing" occurs. If you want to install WAMP 2.5, you must install the C++ libraries 2012 needed by Apache to prevent the error "Unable to start the program because msvcr110.dll is missing" occurs. Important : WAMP includes Apache 2.4 that is no longer compatible with Windows XP and Win. Server 2003. You will need at least : Windows 7 SP1, Windows 8 / 8.1, Windows Vista SP2, Windows Server 2008 R2 SP1, Windows Server 2012 / R2. Once these libraries installed, you can then install WAMP carefree. To download, go to the official website of this program and click the second download of the first column. 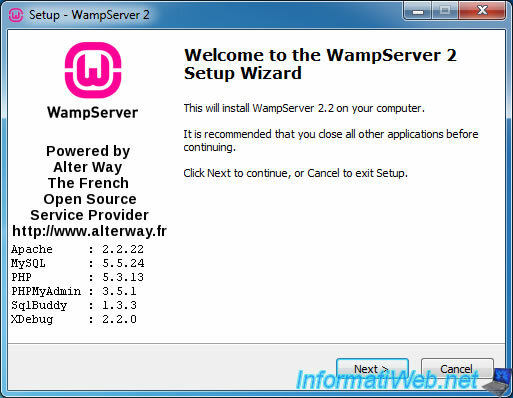 Note: If you want to download the same version of WAMP in this tutorial, then download the Version 2.2E (Apache 2.2.22, MySQL 5.5.24 and PHP 5.3.13). But know any time it is recommended to use the latest versions of programs you use because maybe they have flaws and bugs that will be fixed over time as versions. Then then run the downloaded file. 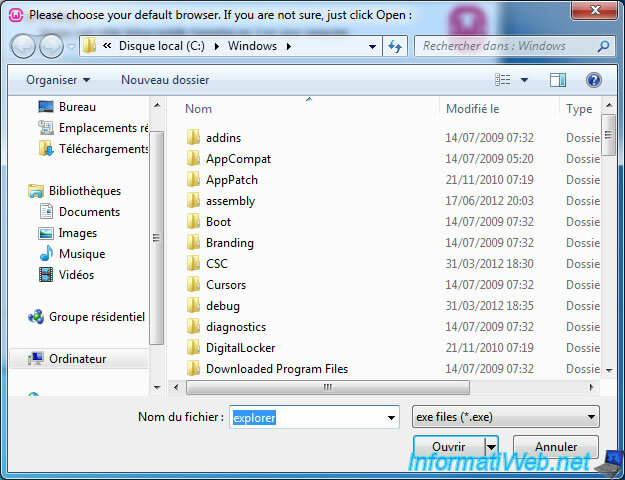 It is recommended to install WAMP on a partition other than the "c" to avoid problems in case of crash or formatting. Note : In case, it is always possible to access files on a computer using a Live CD like Hiren Boot CD (by the Mini-XP), even if Windows will not boot. 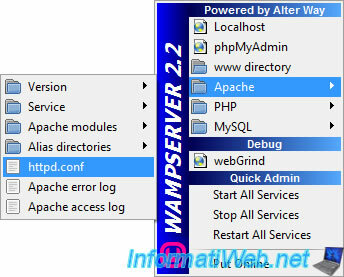 The wizard installs WAMP (to manage your web server PHP and MySQL database server) as well as Apache, PHP and MySQL. By default, the program used to access your site via the menu of WAMP is Internet Explorer. To leave this default setting, just click "Open". Your firewall detects normally that Apache tries to act as a server and that therefore need to be allowed in your firewall (either the Windows or the solution Internet Security). Enter the address of an SMTP server (such as your ISP for example) and your email address. These parameters are used in the "mail()" function in PHP used to sent mail from a Web server. Note : Under Windows XP, it is possible to install an SMTP server through IIS. 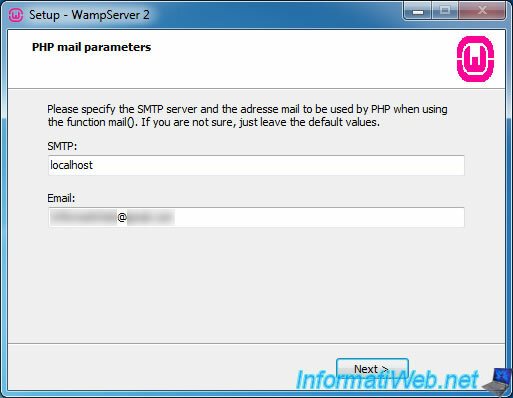 Be careful though not to install the SMTP and not the IIS Web server functionality because it will create a conflict with WAMP in the sense that the Web server uses the same port that we install (ie Apache). Once installation is complete, leave the box checked and click "Finish". Then, if you want your Web server is accessible on your local network and / or from the Internet, click the Apache icon and click "Put Online". If all goes well, the WAMP icon will become green : . 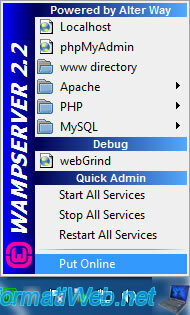 To configure the Apache server, click the WAMP icon and then go to the Apache menu. Then click "httpd.conf" file to open the Apache configuration. The appearance of the Apache configuration file may differ depending on the version thereof. The configuration file is opened via the text editor by default. By default, this is the notebook, unless you install "Notepad ++" or other similar software. # Change the server port. By default, Web servers listen on port 80 which corresponds to the HTTP protocol. # WARNING : If you change the port No. you must also change the line "ServerName ... : 80"
# Use this if you have a registered domain name on the Internet (as a Registrar at OVH, LWS.fr ...). # Note that "/" are in the opposite direction compared to Windows "\". This is because Apache is the Linux world. # - Do not delete the "/" at the end of the path! # Edit the index files for folders (No be useful in some cases). # Note : With Apache 2.2, this line is now between the following tags "<IfModule dir_module>" and "</IfModule>".